Harry - who studied Electrical Engineering at Paisley College of Technology in the early 70s - began his photographic career in his Glasgow home town, standing outside the Apollo, flogging gig-goers newly-developed shots from bands’ Edinburgh shows the night before. Harry’s impulse to guerilla lensmanship swiftly drew him to London: from 1979 to 1984 he was a staff photographer for the music weekly Sounds, providing countless front covers. During those five years, Harry’s photographs covered the postpunk waterfront, from Blondie to David Bowie; the Associates to Devo by way of New Order, Bryan Ferry, Siouxsie and the Banshees, The Birthday Party, The Cramps, The Clash, Altered Images, Felt, The Specials and Suicide (not to mention Wham!, ABC and Spandau Ballet). Harry also documented Scottish bands such as Orange Juice, Aztec Camera, Josef K and the Bluebells. 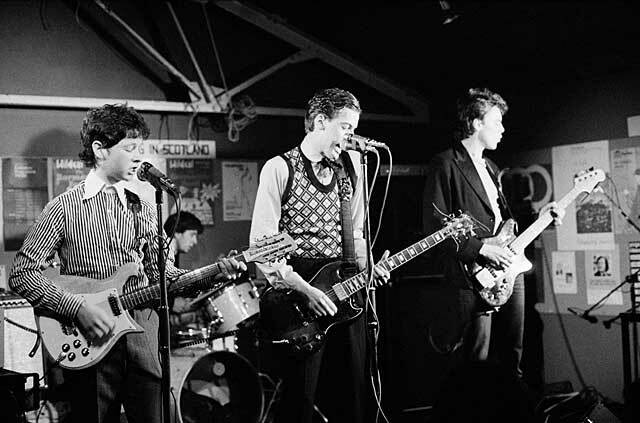 Several of these photos comprise this retrospective, as well as focussing on the Scottish acts of the post-punk era when Glasgow was something of an epicenter of independent music. Exhibition produced by Street Level Photoworks, and co-curated by Ken McCluskey.